This is the second year for Kenyan President Uhuru Muigai Kenyatta after emerging winner for the second time running in the presidential elections that happened in August 2017. The political environment since then has been a tensed one with politicians saying that the deputy president is already campaigning for 2022 elections as Uhuru’s successor. Two of the biggest political parties in Kenya namely Jubilee and National Super Alliance sometime last year came to terms when two most influential figures had a handshake that has left many wondering what the motive of the handshake is. Recently, the president told off those people who think that when one gets elected in a given community the he or she is supposed to develop the home town and interestingly, he called them “Washenzi” and other political leaders did not this in a good way. Women leaders have now joined hands to rule out the political divide in Kenya that has left many lives lying lifeless at the morgues and this is a good move. 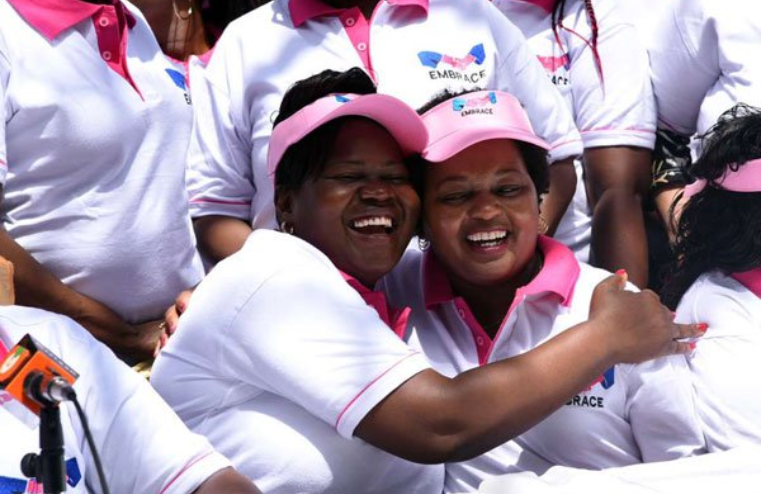 Among the leaders were Homabay County Women Rep Gladys Wanga and Anne Waiguru who were at the forefront of embracing the handshake that has since made the country calm.